Are you ready to graduate to more difficult balance exercises on the Bosu Balance Trainer? Hopefully, you have already mastered the basic standing balance exercises. Grab your Bosu Ball and let’s journey together as you uncover more secrets through your Body Window, regarding your body balance. 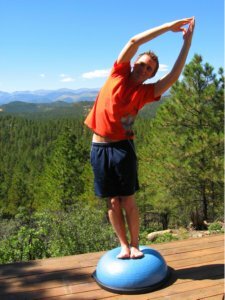 The first exercise for balance on your Bosu Balance Ball is of Alex, my stepson, doing a basic standing pose, but this time with his arms up over his head, below left. This move alone is relatively hard. Keeping your spine straight and in neutral takes focus and real concentration on your balance. Find a point to gaze at and firmly ground your feet into the Bosu ball, by concentrating on sending energy down through your feet as you raise your arms over your head. Then, he decided, without prompting, to take it into a side bend. First he did it to the right. Not bad. Then, he really found his mojo when he took it to the left. Look at his extension – beautiful! Look at the legs together, and the hips tilted to the side! Amazing! 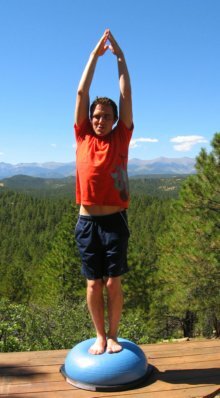 I tried this and I was totally unable to do this balance exercise. It is really difficult! Don't forget that balance training involves using your right brain. 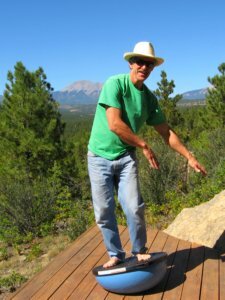 Balance is a special perception requiring lots of body awareness, processed through the right brain. 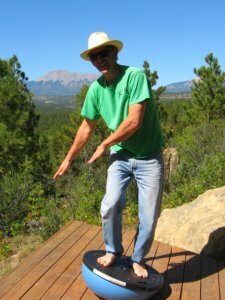 When doing these difficult balance exercises, ask your right brain to give you the spatial perception you need to help you focus and find your body-mind balance! Remember to breathe deeply, throughout all the exercises to bring more mindfulness into this practice! Try the modified Dancer’s Pose. Here is Alex and I trying it. I could only do a vertical pose. Alex was able to go a little farther. 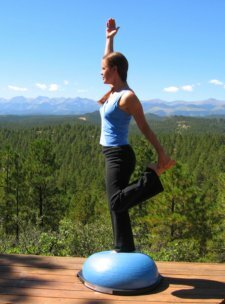 I'd love to know if you can do this balance exercise on the Bosu and go even deeper into the full Dancer’s Pose. If you can, wonderful! 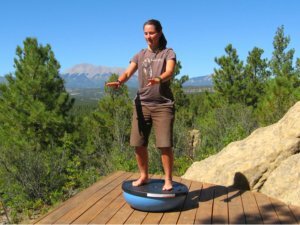 The next centering standing balance exercise we will try is turning the Bosu Balance Trainer into a wobble board. (BOSU stands for BOth Sides Up!) Flip it over on the ball side, and with the hard surface up, try to stand on it. It is tricky getting on it at first. Here is a video of me getting on the bosu ball and then rocking from side to side. I really don't seem to have a smile on my photos or videos. I am concentrating too hard, I guess. 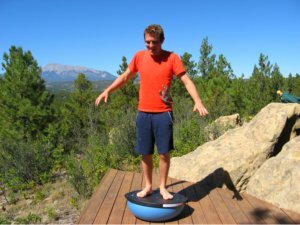 Using the Bosu Ball as a wobble board is a great exercise if you need to practice balancing for skiing or surfing. Then Alex and his friend, Chelsie tried the wobble. Not bad at at all! Then out of nowhere, the grand ski master decided that he needed to show up the young bucks. 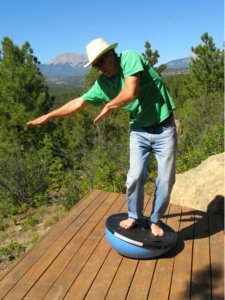 My husband, Rich jumped on the Bosu Balance Trainer as a wobble board and check him out! Finally, let's begin some basic, but more difficult standing movements on the Bosu Ball. This movement can also be done as an aerobic exercise on your Bosu Trainer. Here I am doing what they call the Jump-Stick balance exercise. It is a vertical jumping movement that sticks the landing, like they do in gymnastics. It is quite hard and requires lots of focus. Just look at my concentration! Do try and smile while you do it, even if I don't. 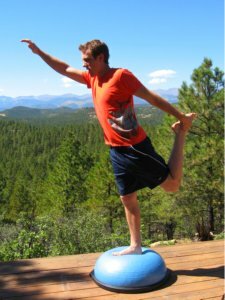 There are many more difficult standing poses on the Bosu ball. 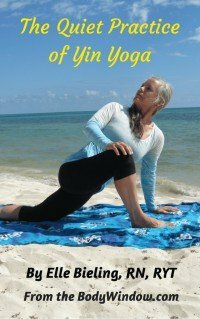 I have done more standing poses in Yoga positions that you might find helpful. 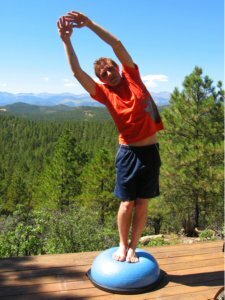 See my article on basic yoga poses using the Bosu Balance Trainer. It takes yoga to a whole new dimension! Go deep into your core, the center of your being to find your balance on your own Bosu Ball Trainer. May your body-mind-soul balance be improved as you learn to focus on your center!